The final year Textile Design and Development students at RMIT have forecast the future and imagined a world that is different from the current political, economic or environmental climate. Thirteen emerging designers set the scene, identifying a design problem within a potential apocalypse in order to develop textile design solutions. These new worlds may have been overrun with water, seductive yet poisonous plants, or other external threats. In some of these worlds, humans have no skin, or they have lost their eyesight, or even have mechanical limbs. The designers have used knitting, weaving, surface design, stitching, felting, embroidery and a range of other experimental and innovative textile techniques and materials to develop solutions to problems in multiple new worlds. Photo drawing involved creating images from photos taken in and around the local surrounds to be posted on Instagram daily. Followers are invited to do the same by photographing things that mean 'home' to them like a garden flower or a local shopfront or a found object on any given day. Using the hashtag #seeingthingsdifferentlyathome followers can post their own images and become part of the photo drawing project. My intention is to draw your attention to see things differently around you. To see 'home' differently and focus on things that are often overlooked in day to day living. Follow Katherine on Instagram: @katherinemarmarasartist to keep up to date and to follow the project. There will be workshops where you can come along and do your photo drawing with others. Venue, times and dates to be confirmed. There may be a small fee charge for workshop participation. Workshop: Photo drawing with Katherine Marmaras at the Box Hill Community Arts Centr, August 19th. Short Stories is an Instagram journey hosted by Melbourne Doll Designer, Gracie Keal, that promises to provide you with a daily dose of happiness. Known for her eccentric dollies, crafted from colourful fluff, grandma’s old curtains and preloved pillowcases, Gracie Keal creates soft, squishy creatures with heckloads of personality. Carmen who likes her morning Weetabix extra soggy and Pete and Cheryl who found love over a Lasagne, will feature amongst others, as part of this Craft Cubed satellite project. Since starting up in 2016, Gracie Keal has sewn up many a doll for Melbourne's young and old. For the month of August, she invites you to delve into the love lives, scandals and personal confessions of her favourite characters, with an Instagram post dedicated to a different dolly every day. This project is about slowing down, putting down devices, being mindful of the preciousness of the right now, the people around us, and feeding our souls/ enhancing our lives with creativity and making. I will spend July/August stitching as many hugs as I can (aiming for 100!) to give to friends and strangers. It's my way of affirming the importance of making, of using my hands to express myself, anchor myself in time and place, share stories and connect with others. I would love YOU to join me too! WHY STITCH-A-HUG and the EMOJI HUG? So much of our communication and connection with each other is virtual, instantaneous, and convenient, and perhaps, not as mindful or authentic as it should be. Stitch-a-hug-month, is an opportunity to slow down and use our hands to make something special for others. Hugs - actual or symbolic - connect us to others in a positive way. Using the emoji hug is a symbolic reminder of the importance of finding balance in the ways that we connect with each other. In the absence of being there to deliver a physical hug, an emoji hug in digital communication might express the idea of care/ compassion/ love in serious or playful ways. spending mindful energy and time to stitch-a-hug for someone else amplifies that expression of care/compassion/love. a stitch-a-hug, accompanied by a real, big, squishy hug in person? KAPOW! !That's super charged happiness!
" inspiration/resources on craftivism, the slow movement, creativity, stitching and well-being. 2. Stitch-a- hug(s) for a friend (s) between now and the end of August. 3. Connect with others to stitch-a-hug and share/post your stitch-a- hug and hug making on social media using #stitchahugmonth and #craft2connect. NOTE: This isn't an anti- social media campaign. The focus of this project is about using craft and making to be present in the moment and finding balance: using the best of what digital/social media has to offer i.e. : connecting beyond geographical and physical spaces and sharing information/inspirations, so that anyone/everyone can have a go at hand making something to share with others. DO I HAVE TO BE ABLE TO EMBROIDER/CROCHET/KNIT/SEW TO PARTICIPATE? You do not have to be an expert/ experienced crafter/maker/ embroider/knitter/crocheter/sewer to stitch-a-hug! As long as you can use a pair of scissors, thread a needle, read, watch, explore ideas, you can have a go! You can use any fibre/textile-based technique or medium that you want. The key is to stitch and make with your hands. Why stitching? Stitching engages your brain in a self-induced state of focusing. It improves concentration, stimulates mindfulness and creativity. Your stitch-a-hug(s) don't have to be "perfect" - just handmade with mindfulness, care and love! Beginner stitch-a-hug inspirations and how to templates are available.Go to www.lennimk.com.au:Stitch-a-hug-month. About me: My name is Lenni Morkel-Kingsbury. I design, make, write and grow things. I live and work in regional Victoria. 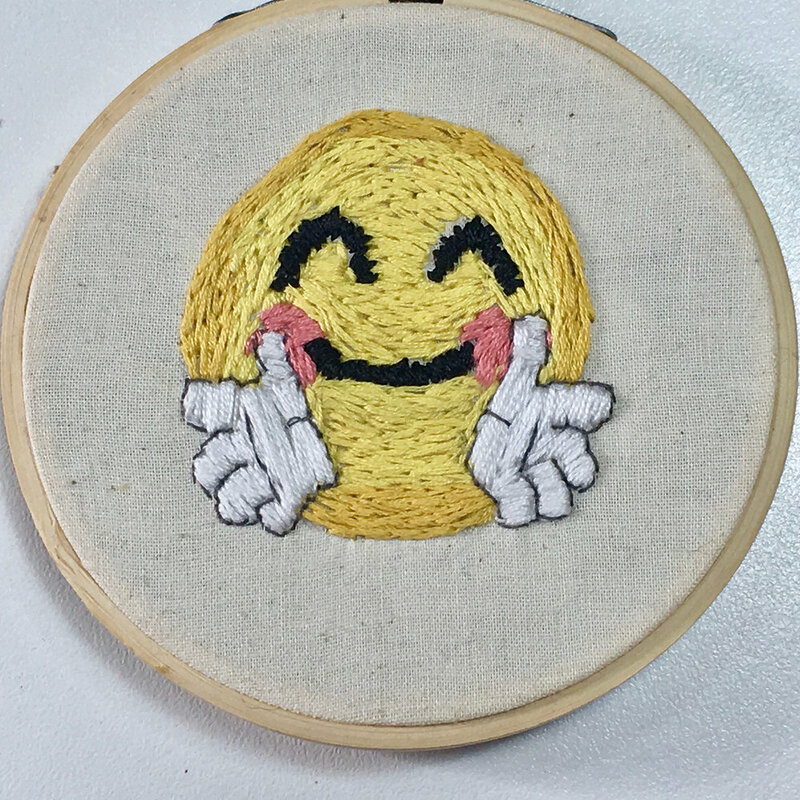 About YOU: You like the idea of stitch-a-hug-month, and want to take the opportunity to slow down, be present and connect through creativity and making.